When record companies started becoming interested in 18 year old Melvin Andrew Grayson, already known professionally as Andrew Tibbs so as not to harm the reputation of his preacher father by having his son singing the devil’s music, the owner of The Macomba Lounge where Tibbs was performing got an idea. Why let another person profit off the abilities of his discovery when he could do so himself? The name of the club owner? Leonard Chess. And so began the winding path that led Leonard and his brother Phil to eventually establishing Chess Records, one of the most renown labels in the history of 20th Century music. Naturally Tibbs himself gets no credit for any of this so let’s try and rectify that a bit here. Tibbs was the son of a Baptist minister and had been singing since childhood in gospel choirs directed by the likes of Malhalia Jackson and then Dinah Washington before she became Dinah Washington and was still just plain ol’ Ruth Jones. Not a bad pedigree you might say. By his late teens he’d left singing about the Lord behind, much to his father’s chagrin, and was openly courting sin and depravation in nightclubs, destined for hell no doubt, but hoping to at least make some money on the road to Hades. Thus we have in Andrew Tibbs probably the first verifiable proof of rock ‘n’ roll’s immediate impact on the young people who heard it. No, not selling their souls for rock ‘n’ roll exactly, but rather being inspired BY rock ‘n’ roll to choose that path for themselves. Though the record that launched this whole craze (Roy Brown’s Good Rocking Tonight) was only a week old when Tibbs made his debut on wax, he was already profoundly influenced by what he’d heard. Like most 17 and 18 year old rock fans of any era the very latest releases will be absorbed in sponge-like fashion within minutes of hearing it. He was arguably the first certified member of the Roy Brown fan club, already claiming Brown as an idol, along with Ivory Joe Hunter, another – slightly more established – name who we’ve just met and will also loom large in rock’s first decade. Listening to him it’s not hard to see what Leonard Chess, and others, saw in Andrew Tibbs, especially at this specific moment in time. His style was an absolutely perfect fit for emerging rock ‘n’ roll. His gospel background brought a more impassioned delivery than was generally heard in secular music at that time and his working relationship with Tom Archia, the leader of the house band at the Mocomba, shaded his records even further away from the downhome blues that were otherwise shaping up to the bulk of the Aristocrat stable at this point. Tibbs offered something new, something different, something very distinctive and it gave the label a very crucial stepping stone to greater vistas in the near future. But before we can get to the future we need to examine the past, so let’s backtrack just a little to set the story up properly. In 1946 the Chess Brothers had opened The Macomba Lounge in Chicago which was a black establishment – patrons and entertainment, only the brothers themselves were white. 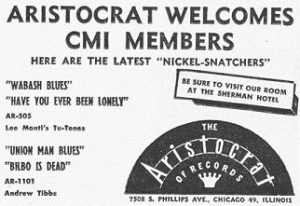 Through their musical connections at the club they became acquainted with Aristocrat Records (for whom Archia recorded) which was headed up by a woman about town, Evelyn Aron, progressive in every way imaginable, not content to ascribe to the “woman’s place” theories that were the accepted protocol at the time. She came from money and expected money to come to her and wasn’t shy about going out to earn it, either in business or at the poker table, which is where Leonard was first introduced to her. When Chess was looking to capitalize on Tibbs’s musical potential a few months later it was only natural he took him to Aristocrat. Though Evelyn Aron was the de facto head of the label much of the initial musical work – signing of artists, direction of the sessions – was done by Sammy Goldberg, and as those who enjoyed the ribald tale of Goldberg’s dealings with Clarence Samuels in Lollypop Mama well know, that despite his Jewish name he was actually black and had worked as a talent scout for other labels for years. It was Goldberg who first asked Tibbs if he had “any lyrics” and when Tibbs didn’t understand what he meant he was told, “original material he wrote” rather than covering popular songs as he’d done on the bandstand. He hadn’t, but when you’re that age you think you can do anything so Tibbs sat down with his mother (what are mothers for after all? ), who apparently was not as bothered by her son’s choice of professions as her husband may have been, and helped him write Union Man Blues. For two novice tunesmiths they immediately gave notice that they were most certainly in the wrong line of work before, as this is very good stuff. There’s an apocryphal story which claims that upon release this record pissed off the union in Chicago to such an extent that it resulted in them refusing to ship, or perhaps even breaking boxes of 78 RPM records, and that Leonard and Phil had to haul them around themselves in the trunk of their car just to get them distributed. This is usually the only time in the condensed version of the Chess Records story where Tibbs even gets a mention, but unfortunately it’s completely made up. The label wasn’t big enough at the time to HAVE union trucks shipping their records to start with, and furthermore the content of the song is hardly ANTI-union at all. Rather Tibbs is claiming he doesn’t deserve the type of dismissive attitude he’s been getting from his girl precisely because he’s a union man, and thus has come to expect certain rights are transferable from such membership at work to the home front. It’s a concept that’s clever without being cloying. The couplets and the drawn out vocals Tibbs employs raises the tension as we wait for the payoffs for his complaints. He manages to affect a risky position here, bemoaning his fate in mournful tones, yet does so in such a way that we don’t look upon him with disdain, if not outright contempt, as those grievances veer ever closer to whining. It’s quite the tightrope walk he traverses because of this, yet he seems remarkably at ease with his performance. His vocals swell at times showing effortless power and control before dropping into a low moan that is almost muted, yet still carries tremendous emotional weight. Throughout it all he never wavers from the delivery the song calls for, which is a hangdog type of misery, almost incredulous that he’s the victim of such bad treatment from a girl he obviously cares for. His voice is impressive – strong, clear, vibrant and flexible, not only able to project his words through the unfortunate aural haze that Aristocrat was known for at this time, but also to convey all of the nuances the story requires. Incredibly Tibbs never takes a wrong step, never tries showing off vocally just to prove he can, never lets himself get carried away by his gloom in a misguided attempt to make it all seem more dramatic. He intuitively knows just what level of sensitivity to maintain in order to keep its poignancy authentic without being grating. Not only does he show he’s got a voice to be envied, but equally important he has the judgment and finesse to be able to wield it with assurance. Oddly enough he’s not joined on this date by Archia, who accompanied him to the studio and co-wrote the flip side with him on the ride over no less. Instead he’s paired with Dave Young’s group – who backed Samuels that same day – and while they’re mostly effective in conveying the necessary mood, the slow dirge-like pacing could use a little more earthiness when Young’s horn takes a solo. As a result it’s more of a dreamy haze he offers up rather than an anguished cry and though it’s certainly not jarring – in fact if you’re not paying close attention you probably won’t even notice the transition, so closely does it stick to the feel Tibbs was embodying – but it also doesn’t add anything to raise the stakes of this inner turmoil. As safe bets go you can’t complain too much because if they took a risk that failed it’d wind up destroying the entire record’s ambiance, but because you can envision the type of gutsier solo that would’ve maintained the atmosphere while doubling down on the anguish you have a right to be a little disappointed. Union Man Blues isn’t a record that’ll jump out at you… something we’ve said a couple times on Spontaneous Lunacy to urge people to give songs that are more understated a fair shake in order to fully grasp their charms, but there’s always a fear among producers in any field that if a comedy isn’t side-splitting then the audience won’t even crack a smile, or unless a story is an epic tragedy won’t garner the least bit of sympathy. So it goes with records too. Unless it’s something that will knock you off your feet on first listen those championing it will be convinced that it’ll be shrugged off entirely and never be given a second chance to let those more subtle attributes work their way into your heart. In all of those cases that’s probably underestimating the ability of the reader/viewer/listener to absorb it all and their willingness to listen with an open mind. After all if an 18 year old was worldly enough to deliver something like this in his very first recording session surely those interested in reading about things like this seventy years later are worldly enough to give it a fair shake themselves. As will usually be the case over the years Andrew Tibbs shows here it’s the kids who will lead the way in rock ‘n’ roll. 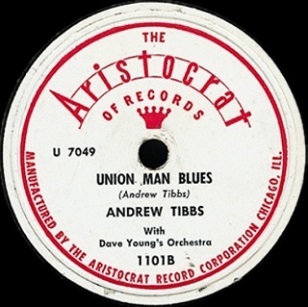 Leave a reply on "Andrew Tibbs: “Union Man Blues”"